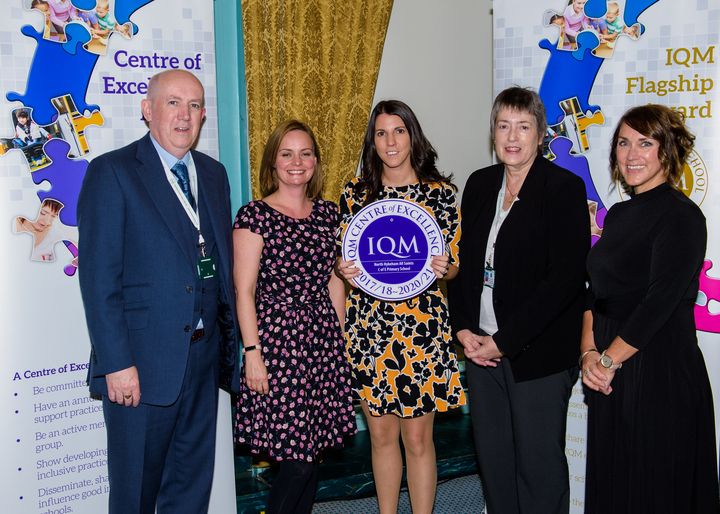 North Hykeham All Saints CE Primary School in Lincoln has achieved IQM Centre of Excellence status. North Hykeham All Saints Church of England Primary School is a warm and friendly learning community. First impressions on arriving at the school are of happy, engaged children and an orderly learning environment. Children with a variety of needs are welcomed at the school. Parents clearly value involvement with the school; they feel able to approach all staff and the Headteacher. The school endeavours to establish strong relationships with parents and involve other agencies if needed. The school firmly believes that children learn best when school and home work closely together and have lots of different ways for parents to engage in their child’s learning. ‘Family Learning’ sessions are made available for parents and children to work together in fun ways. Opportunities exist to engage in activities associated with reading and understanding of the world including growing food. Children were highly delighted to show me carrots growing on the day of the visit!! The school is in the diocese of Lincoln. Religious Education, prayer and celebration are central to the life of the school. Key values are shared openly through displays and worship. The school’s vision underpins all aspects of school life, the school motto is ‘Valuing Each Child’ and the school team work hard to achieve this. The team seek to enable children to develop skills of literacy and numeracy, applying them in everyday life; understanding and respect for other cultures and beliefs developed through spiritual, moral, social and cultural values and nurtured in a Christian ethos. It fosters a caring attitude toward others within the school community and beyond. They aim to enable children to be prepared for life in the wider world through the curriculum they offer. During this IQM assessment I was particularly impressed by the enthusiasm of the IQM Team, SLT and the support and direction of the Headteacher together with the enthusiasm of her team of educational professionals, including support staff. Governors and parents are pleased to be able to be associated with All Saints Church of England Primary School. Attendance is monitored. Parents are reminded that good attendance is vital to their child’s education. The Inclusion Manager indicates that the aim for every child is to achieve at least 95% attendance over the school year. The Family Support worker reaches out into the local community to support parents and in turn, this impacts on the learning of the children. A range of data was made available for the assessment for the Inclusion Quality Mark, including the Self-Evaluation Report, pupil progress data and other resources. Information was accessible on the school website including the latest inspection report (2018). There was opportunity to have conversations with support staff, teaching staff, governors, parents and the Senior Leadership Team during the course of the day. The Inclusion Manager enabled a tour of the school, opportunity to view intervention work, attend worship, to have lunch with children and see them at play, on the field and yard. •	Detailed data analysis is available for staff to use to inform pupil progress. •	Careful consideration has been given to appropriate intervention strategies to support reading and writing. •	A new maths scheme has been purchased to help deepen children’s thinking and understanding. •	Development of the school site has enhanced facilities for all children and families including outdoor spaces and a library. •	Rewards and sanctions are consistently applied encouraging independence and fostering good behaviour throughout the school. •	A friendly atmosphere is modelled by staff, and children are treated with respect. The behaviour of pupils toward each another and toward professionals is very good indeed. Staff are well-supported, performance management is clearly in place and well used, targets are determined, focusing on progress of pupils and development needs. The positive approach to monitoring emphasises that monitoring is not something that is ‘done’ to teachers but an approach to ensure that learning and personal needs of children are addressed. It is a tool to support staff and seen as enabling. The strategies of drop-ins and learning walks are used to gather information and support staff.